It's Friday! 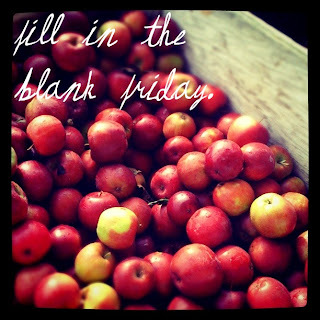 You know what that means - Linking up with Lauren at the little things we do for another Fill in the Blank Friday. Nothing says fall like clear and crisp sunny days. My favorite autumnal tradition is carving pumpkins with Hubby. A few years ago, he carved a masterpiece. But I think it took all of his energy and last year he chose not to participate. Hmph. I carved solo. Hoping he will partake this year! My favorite fall treat is banana bread... And Ryan's Captain Morgan Apple Cider. Fall makes me think of soccer because that was a big part of my life from age 4 to 18. Autumn free form word association, go! Pumpkins, cider, crisp leaves, crisp air. My go-to outfit in the fall is anything I can layer. My favorite fall holiday is (Halloween, Thanksgiving). Thanksgiving! I love the scrumptious food, inevitable food baby and coma, and celebrating with loved ones. Cider...yum. I forgot about that stuff.